As you know, Hinduism is the modern name for the major religion that is practiced in India. Other religions also had their beginnings in India. One of these is the religion of Jainism. Jains teach ahimsa (uh•HIHM•SAH), which means "nonviolence." Jains practice ahimsa very strictly. They believe that every living thing has a soul and should not be hurt. Some Jains even wear masks to avoid accidentally breathing in small insects. ESSENTIAL QUESTION What are the main teachings of the religion of Buddhism? Another religion called Buddhism also began in India. Buddhism is based on the teachings of Siddhartha Gautama (sihd•DAHR•tuh GAW•tuh•muh). He was a prince who gave up his wealth and position to try to understand the meaning of life. Later, when he began to teach what he had learned, he was called the Buddha, or enlightened one. 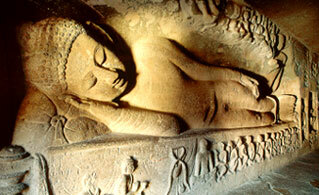 Resting Buddha - This carving of a sleeping Buddha is in the Ajanta Caves in India. According to Buddhist teaching, as Siddhartha Gautama sat meditating, an evil spirit tempted him to stop seeking truth. First the spirit sent beautiful women, but Siddhartha ignored them. Then flaming rocks began to rain down on him. But as they drew close to Siddhartha, they became flower petals. Finally, the evil spirit asked what right Siddhartha had to look for truth. Siddhartha touched the ground, and a voice thundered, "I bear you witness"–which means to testify in one's favor. That night Siddhartha's meditation grew even deeper, and he received his great insights. He had become the Buddha. The evil spirit decided to tempt him one last time. "No one will understand your deep truths," the spirit taunted. The Buddha simply answered, "Some will understand." Siddhartha was born a Hindu prince. A priest had predicted that he would become a wandering holy man. To prevent this, Siddhartha's father gave his son every luxury and sheltered him. Siddhartha did not see old age, illness, death, or poverty until he was 29. When he finally did see such troubles, they upset him. He fled his home to search for peace in a world of suffering. For six years, Siddhartha starved himself, but this sacrifice did not help him find the answers he sought. Then he sat under a fig tree and meditated until he found understanding. This gave him insights into reality, which he called the Four Noble Truths. 1.People suffer because their minds are not at ease. 2.That condition comes from wanting what one doesn't have or from wanting life to be different. 3.People can stop suffering by not wanting. 4.People can stop wanting by following the Eightfold Path. The Eightfold Path involved having the right opinions, desires, speech, actions, job, effort, concentration, and meditation. This path, the Buddha taught, could lead to nirvana (neer•VAH•nuh), or the end of suffering. Reaching nirvana broke the cycle of reincarnation that Buddhists, as well as Hindus, believed in. 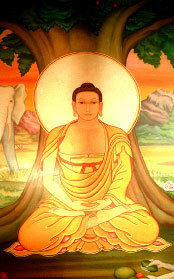 The Buddha believed in the practice of ahimsa. But he didn't worship Hindu deities. He also rejected the idea that people in the upper castes were holier than others. After the Buddha died, his followers gathered his teachings to pass on to others. These collected teachings are called the dharma (DAHR•muh), which means the true nature of things. Dharma is often shown symbolically as a wheel. Monks and nuns—men and women who live in religious communities—helped develop the formal religion of Buddhism. Other Buddhists became wandering holy men and tried to live as the Buddha had. Over time, Buddhism split into many branches. Some branches stressed the importance of being a monk and studying the Buddha's life. Others stressed meditation. Some Buddhists taught that ordinary people could become Buddhas. Such holy people could work to save others through acts of mercy and love. Most Buddhists worshiped the Buddha as a divine being. 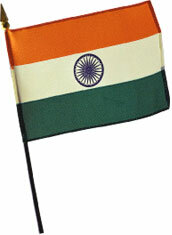 Indian Flag - In the center of the flag of modern India is a Buddhist symbol—the wheel of dharma. ESSENTIAL QUESTION How did the Maurya rulers unite northern India into the first great Indian empire? One reason Buddhism became so influential is that a famous Indian king ruled by its teachings. As you will read, he was the third king of the Maurya dynasty, which united India. For centuries, separate Aryan kingdoms battled each other. Around 550 B.C., Magadha (MAH•guh•duh), a northeastern kingdom, began to gain strength. About 321 B.C., Chandragupta Maurya (CHUHN•druh•GUP•tuh MOWR•yuh) became king of Magadha. He conquered much territory. His Maurya Empire soon covered much of the subcontinent. Chandragupta controlled his empire by using spies to learn what people did and an army of soldiers to keep order. Many officials ran the government. To pay these people, Chandragupta taxed land and crops heavily. Surprisingly, legend says that he became a nonviolent Jainist monk at the end of his life. The greatest Maurya king was Chandragupta's grandson Asoka (uh•SOH•kuh), who began to rule in 269 B.C. Early in Asoka's reign, he fought a bloody war and conquered a neighboring kingdom. Afterwards, Asoka decided to rule by Buddhist teachings. He gave up constant warfare. He tried to rule peacefully by law instead. Asoka had his policies carved on rocks and pillars. Rocks that survive from his reign advise people to be truthful and kind. Others urge people not to kill living things. As a result of Asoka’s patronage, Buddhism attracted people to its monastic order. Asoka and the Buddhist rulers that followed him sent missionaries to bring new converts to Buddhism. At the same time, he let people of other religions worship freely. Asoka’s officials planted trees, dug wells, set up hospitals, and built rest houses along main roads. These improvements allowed people to travel in more comfort than before. Better travel conditions helped traders and officials. The popularity of Buddhism meant that fewer people were worshiping Hindu deities. Early Hinduism had a set of complex sacrifices that only priests could perform. They conducted the rites in Sanskrit, which few people spoke anymore. This caused people to feel distant from the deities. Many people turned to Buddhism instead. Rulers who had come under the influence of Buddhism encouraged this shift. Hindu thought began to change. Poets began to write hymns of praise to the deities Vishnu and Shiva. These poems were written in languages that common people spoke, instead of in Sanskrit. The poems became popular across India. As a result, many Indians felt a renewed love for their Hindu deities. This renewal of interest in Hinduism occurred at the same time as a decline in Buddhism. Eventually, Buddhism lost most of its followers in India. By that time, however, it had spread to many other countries in Asia. Vishnu - The deity Vishnu remains one of the most popular deities in India. 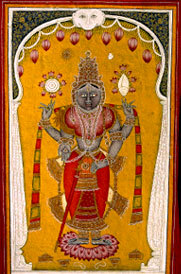 This Indian miniature dates from the 1700s. ESSENTIAL QUESTION Who were the Guptas, and when did they rule India? The Maurya Empire collapsed shortly after Asoka died because of poor rule and invasions. Five centuries of conflict followed until the Gupta (GUP•tuh) family took control. Like the Mauryas, the Guptas began as leaders in Magadha. Chandra Gupta I became king in A.D. 320. (He was not related to Chandragupta Maurya.) Right away, he married a king's daughter and gained new lands. Later, his son enlarged the empire by fighting wars. But Chandra Gupta's grandson, Chandra Gupta II, was the greatest ruler of the family. During his reign (A.D. 375 to 415), India had a golden age—a time of great accomplishment. Under Chandra Gupta II, Indian arts flourished. Architects erected gracefully designed temples. Artists painted murals and sculpted statues, many of which had religious subjects. Kalidasa (KAH•lee•DAH•suh) wrote brilliant Sanskrit plays and poems. His most famous play is about a young woman named Sakuntala (SAH•koon•TAH•lah). The king falls in love with her and promises to marry her. Later he forgets her because of a curse laid on him. The couple are reunited in heaven. Today Kalidasa is considered one of the greatest writers India ever had. 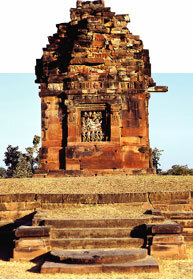 Vishnu Temple - During the Gupta period, Hindu temples began to be built with pyramid-shaped roofs. This architectural style remained very influential. One mathematician figured out the length of a year. He also estimated the value of pi. Pi is the number that is used to calculate the length of a circle's boundary. Doctors added new techniques to the ancient practice of Ayurvedic (EYE•yuhr•VAY•dihk) medicine. It is one of the oldest systems of medicine in the world. It promotes health by using diet, exercise, and other methods to maintain energy in the body. Indian artisans developed advanced methods of metallurgy (metal working). In Delhi, an iron pillar erected about A.D. 400 towers almost 23 feet over the city. No other people were able to manufacture such a large piece of iron until at least 1,000 years later. Unlike most iron, the pillar has resisted rust for 16 centuries. One possible explanation is that the iron pillar contains more phosphorous than most iron does. As a result, a protective coating formed on the surface. Gupta India profited from foreign trade. Traders sold Indian goods such as cotton and ivory to foreign merchants. Indian merchants bought Chinese goods such as silk. They resold these goods to traders who were traveling west. Both traders and missionaries spread Indian culture and beliefs. Hinduism spread to parts of Southeast Asia. Buddhism gradually spread to Central Asia, Sri Lanka (formerly called Ceylon), China, and Southeast Asia. Iron Pillar - This pillar from the Gupta period stands more than 20 feet high and weighs about 1,300 pounds. A new religion called Buddhism taught people to escape suffering by following a path of right living. Influenced by Buddhism, King Asoka tried to rule with peace, law, and good works. Under Gupta rule, India had a golden age. The arts, science, metallurgy, and trade prospered. The spread of Hinduism and Buddhism shaped Asian cultures. Many Asian people still practice those religions today.